Onslaught ( MadSecta in Japan) sees the player as a member of a military team sent to a research colony on a distant planet after contact is lost. Upon arrival the team is attacked by swarms of cyborg insects, which the player must destroy and ultimately uncover what happened to the colony. The game features 13 levels grouped into tiers, with the player needing to pass all stages in a tier and defeat a boss in order to progress to the next one. 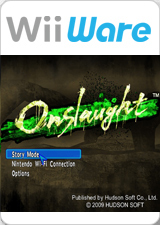 Like other Wii games in the genre, Onslaught uses the pointer function of the Wii Remote to aim and the Nunchuk to move. Motion controls are also utilized with a throwing motion of the Nunchuk used to toss grenades and waggling of the Remote to reload. Motion controls are also used to wield a laser whip, and to wipe off insect blood which can blind and damage the player. Players can also issue simple orders to two squad mates who provide additional support, while some levels give the player the chance to pilot a heavily armed vehicle. The game also features online score-based competitive and co-operative multiplayer for up to 4 players through the Nintendo Wi-Fi Connection. As shown on another games, Dolphin doesn't support Internet connection. That section of the game is unplayable. During story scenes like the opening text display and between missions, emulator performance may be very slow. Disable Idle Skipping to fix this. The graph below charts the compatibility with Onslaught since Dolphin's 2.0 release, listing revisions only where a compatibility change occurred. This page was last edited on 18 February 2018, at 12:59.